Bio: Now living in Santa Fe, artist Nancy Silvia grew up near the ocean in Connecticut. Nancy claims one of her earliest visual memories is of the horizon line, and her earliest influence as an artist were the marine paintings of New England. Nancy earned a BFA from Rhode Island School of Design and an MFA in Painting from Yale University. 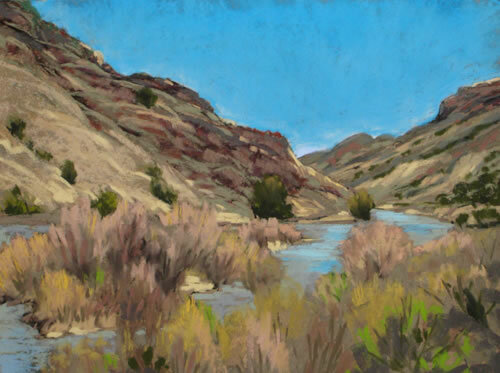 Professional memberships include American Society of Marine Artists and Signature Membership in Pastel Society of America, Pastel Society of New Mexico, and Plein Air Painters New Mexico. Nancy has been awarded residency grants at The Ragdale Foundation in Illinois and The Ucross foundation in Wyoming. She has been exhibiting since 1990 and her work has been seen in galleries and museums, and included in public and private collections, in both the USA and Japan. Her work was featured in American Artist in January 2005 (oversized sharpei dogs - unforgettable). Nancy and her family lived in Hunterdon County for many years, before moving to New Mexico. The artist is represented in New Jersey by The Coryell Gallery, and by Rabbet Gallery in New Brunswick. Gallery: Paintings: New Work; Landscapes; Animals; Field Studies. Image View: Thumbnail images are enlarged in a pop-up window; download is possible. Information is provided on work. Pilar in Spring is 12 x 16 ins, 500 x 373, 41 KB.